2010 was a relatively cool growing season allowing the grapes to mature slowly. A heat spike in late September helped fully ripen the grapes. Overall, the harvest was about 2 weeks later than usual, taking place from 10/6 to 10/20. In 2010, grapes were harvested from 4 vineyards in Anderson Valley: Klindt Vineyard (KV), Londer Vineyard, Conzelman Vineyard (CV) and Day Ranch. From Mendocino County: Oppenlander Ranch. The wines were fermented utilizing native yeast. Native ML was allowed to start with later inoculation to assure completion. The wines were aged in 45% new French and Eastern European Oak. The wines were blended and bottled in April, 2012. The core of this wine is Day Ranch Martini and CV Martini supplemented by Londer Swan, KV 777, KV 115, Oppenlander 115 and CV 115. The wine presents with a pretty ruby color. The nose is very forward, bursting with red fruit notes of cherry and cranberry. 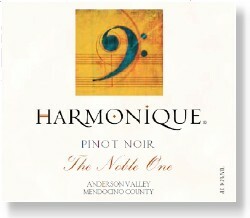 A straight up Pinot Noir, the flavors are luscious and refined. Red cherry dominates but is complemented by red currant, baking spices and cola. The tannins are subtle and integrated along with the oak. The spice and cola continues into the long and lingering finish. This is a beautiful wine with excellent structure and balance. It is at its peak now and should retain its elegance for another 5 years.